Last night a couple of grandkids celebrated their birthdays. Fleece tops were given and well liked. 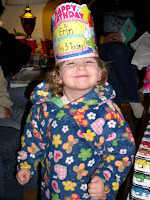 Someone obviously loves her birthday crown. Their birthdays are two weeks apart and the party was in the middle. The boy, MB shares a birthday with his aunt in Illinois. There were lots of adults and children from both sides of their families and the usual mess and mayhem happened. A good time was had by all. 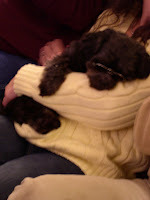 Among the guests was one of my canine grandkids. You may not be able to see, but the dog is wearing his new sunglasses. There is a strap under his chin and on that fastens behind his ears. BooBoo is not an only dog, but his brothers did not make the trip to Cleveland from Erie PA. His mother brought a pattern for one of her quilt designs. It is a surprise gift so no more will be said. I am very impressed by my daughter's talent. Mystery sock report: Both pairs are finished. 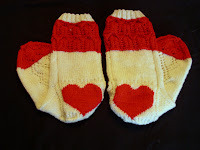 I changed the toes of the Valentine ones from what the designer said. They now have a lace heart on the wedge toe. 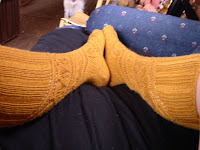 The gold socks are knee socks, with eyelet holes for ties of needed to hold them up. That is the only change I made to this pattern. There is no mystery sock until March. I'm knitting socks for the men in the family now. I socked all the women for Christmas. I'll decide later if the socks will be Christmas or birthday gifts.